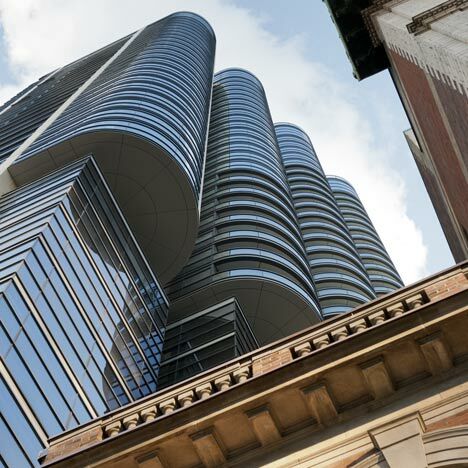 Architects Foster + Partners have attached a 35-storey tower onto the side of two renovated 1920s buildings in Vancouver’s financial district. Nestled alongside the restored Ceperley Rounsfell Building and the retained facade of the Royal Financial Building, Jameson House provides 23 floors of apartments above offices and shops on the floors below. The glazed tower’s northeast elevation is articulated as four vertical tubes, which begin at the cornice height of neighbouring buildings. Other projects we've featured in Canada include an interesting canoe store and a set of plywood skating shelters - see them all here. Photography is by Nigel Young. Fusing old and new, the site connects the city’s financial centre with its emerging creative hub, and the scheme integrates two 1920s Beaux Arts structures: the entire internal double-height volume of the A-listed Ceperley Rounsfell Building has been returned to its original configuration and the facade of the B-listed Royal Financial Building has been retained. The development comprises eleven storeys of offices and shops, topped by twenty-three storeys of apartments. The tower’s form articulates these different functions: the first two storeys continue the row of shop units at street level, while the uppermost office floor aligns with the cornice line of the adjacent building. Contrasting with the flush facade of the offices, the residential floors curve outwards in four wide bays, which are staggered to allow daylight to reach neighbouring buildings and oriented to provide uninterrupted views of the landscape. The tower’s flexible plan supports a variety of apartment types, with interiors by Foster + Partners and living spaces in the deep curve of the window bays. At the top of the tower are two-storey penthouse apartments and landscaped roof terraces. The design was developed in response to the local climate, seasonal sun paths, prevailing winds, humidity levels, air temperatures and precipitation rates specific to Vancouver. Foster + Partners’ in-house engineering group – formerly PHA Consult – has been involved in the project from the outset, in a fully integrated approach to environmental engineering and architectural design. This has led to innovations such as chilled floors and a mechanised valet parking system, which reduces the number of parking levels and associated excavation, lighting and ventilation requirements.